Baking rice in the even heat of a heavy pot yields perfectly cooked, fluffy grains. The technique is easy, and the rich flavor of the coconut milk is a perfect complement to the rice. Different parts of the coconut have different types and amounts of FODMAPs in them; some coconut products are therefore more IBS-friendly than others. The canned coconut milk used in this recipe is lower in FODMAPs than coconut milk "beverage." Enjoy this dish with grilled or sautéed vegetables, fish, or chicken. In a 4-quart ovenproof pot, melt the coconut oil over medium heat on the stovetop. Rinse and drain the rice in a mesh strainer and add it to the coconut oil. Brown the rice, stirring occasionally, for 5 minutes. Add the salt, coconut milk, and water. Bring the rice to a boil. Cover the pot tightly with a heavy lid or aluminum foil and place it in the oven. Bake for 35 minutes. Test it to make sure it is almost tender. If it isn’t almost tender, add another quarter cup of water and return it to the oven for another 10 minutes. Allow the rice to rest, covered, for 5 more minutes to complete the cooking process. 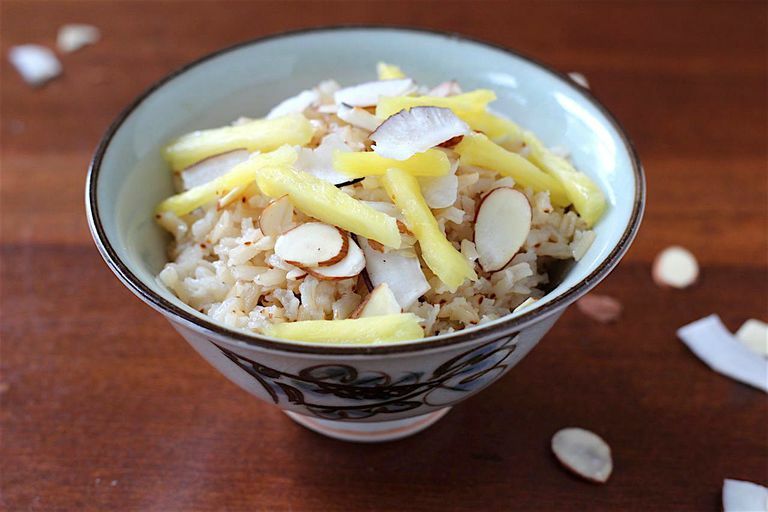 Fluff and serve the rice, garnished with slivered pineapple, coconut flakes, and sliced almonds. Some varieties of brown rice need to be cooked longer than others and therefore may need more or less cooking liquid. Experiment with your favorite brown rice to determine the ideal amount of added water and baking time. If toasted coconut flakes or sliced almonds cannot be purchased, you can toast them yourself. Use a small, heavy skillet, and toast them separately in case they brown at different rates. Preheat the skillet over medium-high heat. Add the coconut flakes or almonds and toast them, stirring continuously, until they are light golden-brown, 2 to 3 minutes. Don't leave the pan unattended, as they burn easily.